Many of the pictures in this post were taken with a "lesser camera" so the quality is a bit grainy. This shot includes a little gift that I also wrapped with felt. Often I'll just "wing" things, but these ornaments actually had patterns. Good thing, because I don't think in that sort of dimension; I think in stick figures. It would be wonderful if the patterns for the ornaments could be found lying around in a drawer somewhere, because I've searched the entirety of the world wide web for the site at which I found these originally, along with their patterns, but to no avail. So I don't have them to show you how they were made. We were broken into and my computer stolen while they were being created, so anything I had on my computer from that time that hadn't been backed up was lost. Those patterns would come in handy too, because I was entertaining thoughts of a sort of felt ornament reprisal this year. 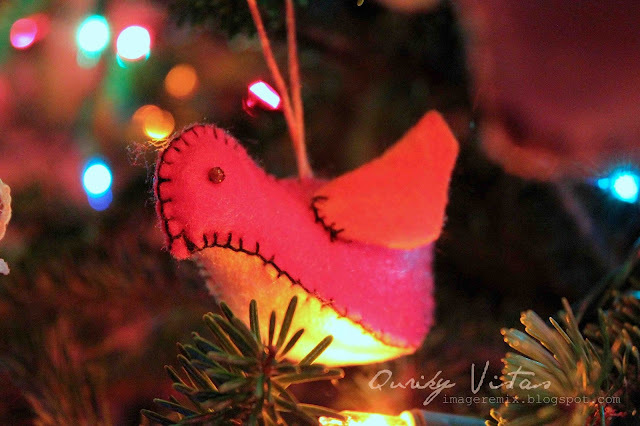 Then again, there are tons of adorable felt ornaments out there for inspiration, Christmas trees of every shape and hue, sweet little birds, snowmen, penguins and more. A quick Bing Image search has been enticing me to pull out the felt again...and to start cutting and stitching. I like to create or buy ornaments for the kids each Christmas. We missed a few years in there, but one year soon everyone will be taking their ornaments for their own trees (as was the plan), and my tree will be left fairly barren. Most of what's on our tree was made for the kids. It will be a hard "letting go", to be sure. Our handmade ornaments have a special place in my heart. The little pinecones are cute, however brown ornaments don't show up well on a real Christmas tree. 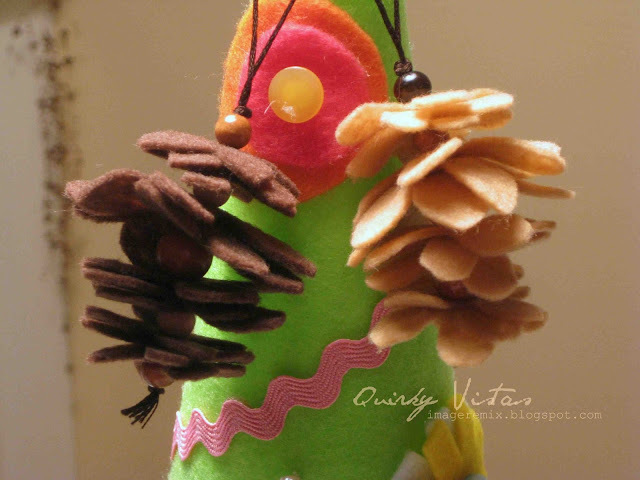 A felt tree was also crafted on the fly, wrapped around styrofoam, secured with blanket stitching down the back and decorated with colorful felt circles, buttons, rick rack and little pearls. Maybe this year a star or an angel could be crafted for the top. This was all done within a short span of time. When inspiration for Christmas gifts hits, I tend to go into overdrive and get a lot done within a week or so; usually just before Christmas, and finishing just in the nick of time. Just call me "Last Minute Liz". It seems a looming deadline suits me. One thing led to another that year and these felt envelopes were concocted, as well, to hold the cards and tags I had created that were going to be given to some of girls in the family. The envelopes were used as the wrapping since they were so colorful. The small green one with the strap was just a sort of little envelope purse I made for my young niece, and it was used as the wrapping for some small girly gifts. 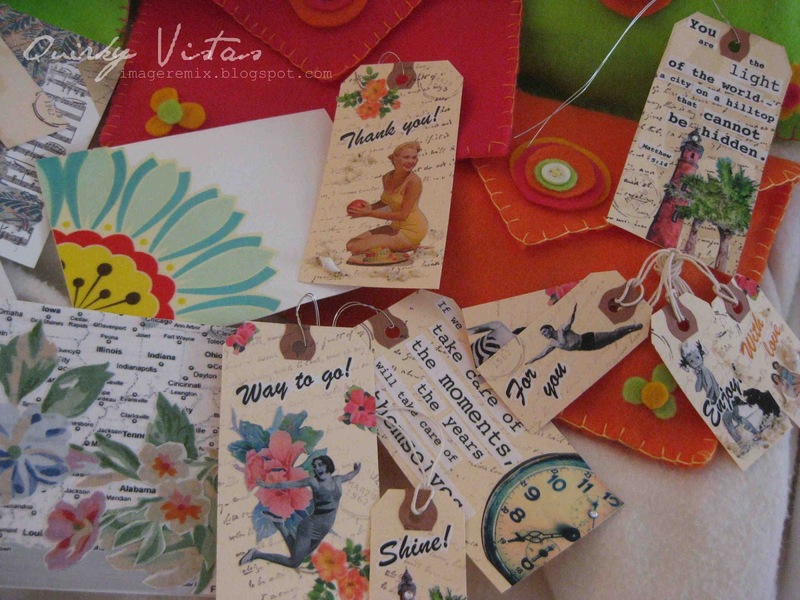 Here are just a few of the zillions of cards and tags I made and gave that Christmas. Each envelope was crammed with a variety like this. No one got the same mix because many were one of kind. The "Sing for Joy" (to God our strength) card was embellished with yarn and a wire treble clef I created. 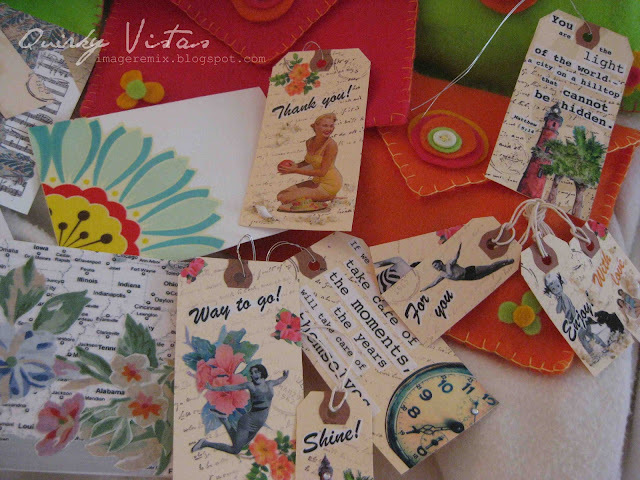 The cards and tags had become a sort of crafting addiction throughout the year. The colors, textures (including wire, fabric, yarn, sand, shells, crystals, buttons, etc.) and designs drew me in and kept me wanting to think up and create more. It was hard to stop. It was a colorful Christmas to be sure. Now it's time to get working on an idea for some things to make and give this year. Hopefully "Last minute Liz" will show up. If not, it may be because she was discovered on the couch with her feet up listening to Christmas carols eating ice cream with hot fudge or some other delectable goody, leisurely reading a book at the beach or taking some time for ski vacation all while someone else maintains the yard, car, house and whatnot. Pfffbbttt! Yeah, right! That would, however, be my wish list of ways to spend the next month. No, I'm sure I will find something to get "the fever" over this year. Like many of you, there will be plenty to keep me busy, even if it's just to cook up or bake up some goodies like fudge, penuche, hard tack, our family's Santa cookies or some fun new item Casey finds on Pinterest. One just never knows what inspiration will strike. Hopefully it will strike soon. I'd like to ditch the "Last Minute" moniker this year and fully enjoy the creative opportunities. We'll just see how that works out. Here's hopin' for that, and hopin' that YOU have a Merry Christmas season! I have made a few felt ornaments myself in the past. I bought some more felt this year yoo but didn't get time. Love your tags. It's been a while and wanted to pop over and say hello. I love the felt, they are just beautiful. Enjoyed catching up on your lovely blog as always. Have a great weekend. Liz! hi! those are adorable. 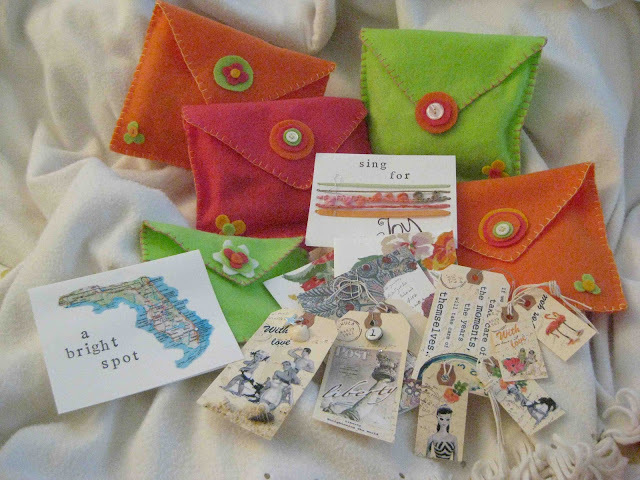 what is it about felt that is so wonderful and feminine and crafty? love the stuff, huh? QUANTAS COISAS BELAS VEJO POR AQUI AMIGA,FICOU SUMIDA E VOLTOU COM TUDO NÉ??RSRS.BEIJOS.VALÉRIA. I love felt ornaments! They are so cute and charming :) Hope you have a wonderful weekend, Liz! I like your pinecones!!!! !Very clever idea!!!!! All are beautiful and your envelopes too!!!!!!! Liz, my sweet friend, kisses!!!!!!!! Hi, There is a book called Fa La La La Felt that has some cute ornaments. Wishing you and yours a blessed Christmas. Barbara. I'll check it out. Thanks, Barbara! Your ornies are so cute! I love them! You might take them apart and trace around the pieces to make new patterns....or not :( That's a lot of trouble. But anyway, the ones you have are great!! Have a great weekend. My favorites are the cones and the envelopes. i adore those tags as you knew I would! 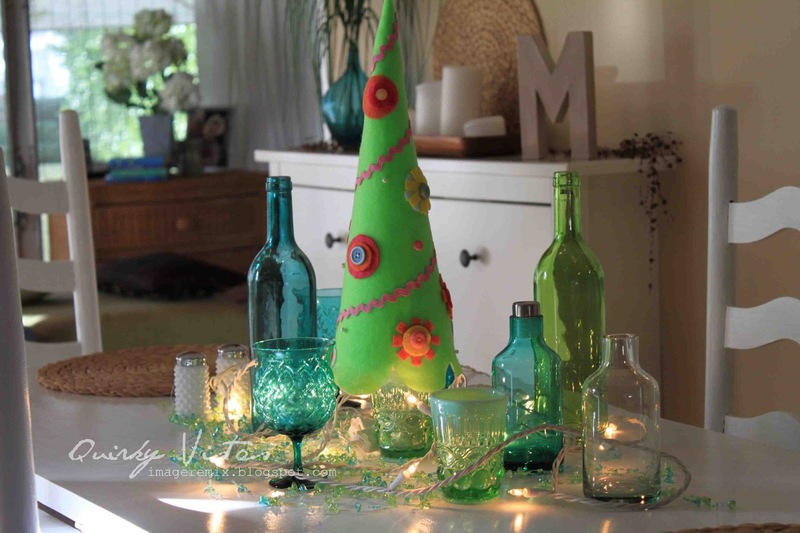 I have decided to make my Christmas stuff in February this year to avoid the last minute thing. I do not know if early will work. I may forget where I put the things. I still have a missing present from several years ago floating about the house somewhere. Love the big centerpiece tree - very Whoville!! Love felt ornaments! They really add a special touch to the tree! these are all darling, liz! so sorry about the thieves, though. 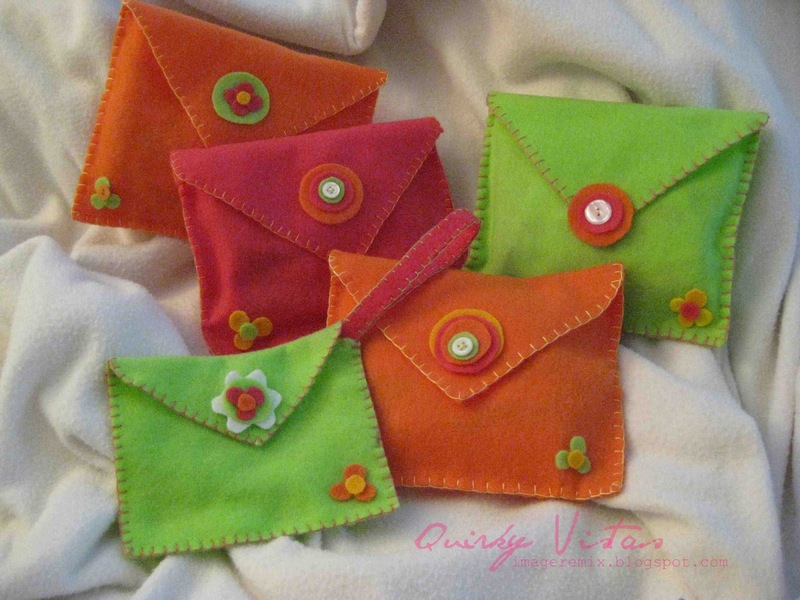 the little envelopes/purses are just the cutest!! and i love the tags, too! These are all so adorable!! 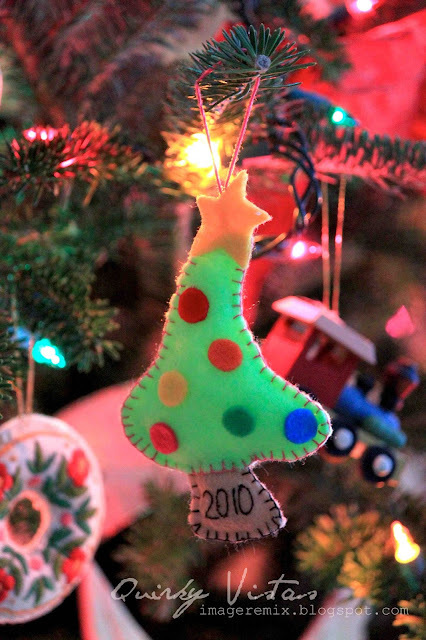 I love the felt tree and all your sweet colorful ornaments. Those envelopes are a wonderful idea. I'm sure it was so addicting to create those pretty tags...I probably wouldn't be able to stop. Thanks for sharing these Liz. I am also a felt junky, and love making ornaments with them. Yours are really cute, loving the envelopes. So keep on felting, you do so well at it. 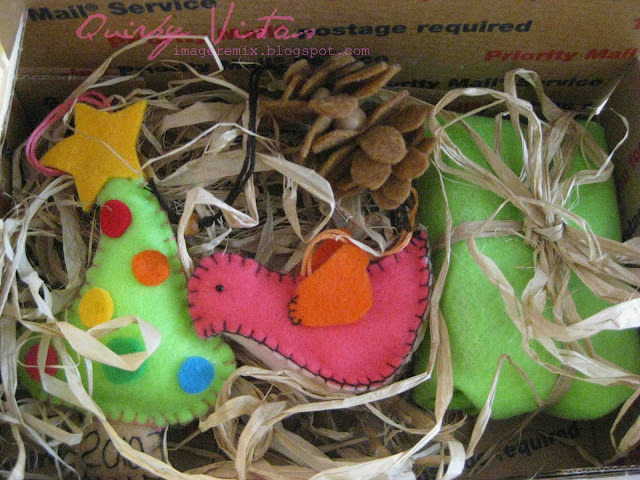 Liz, your felt ornaments are adorable!! I love them. Oh, I think I'm coming down with ....FELT FEVER!!! These are just the cutest, and I think I just might be able to do it. Thanks so much for sharing these with us. Now off to get some felt! I love felt ornaments! I totally get your felt fever! Very cute! Sometimes winging it can be intimidating but felt allows you to do that! Great ideas! Loving all your felt projects! Thanx for oming to THT.